Size: Fish is almost 9 inches long! This is a very rare fossil fish specimen. 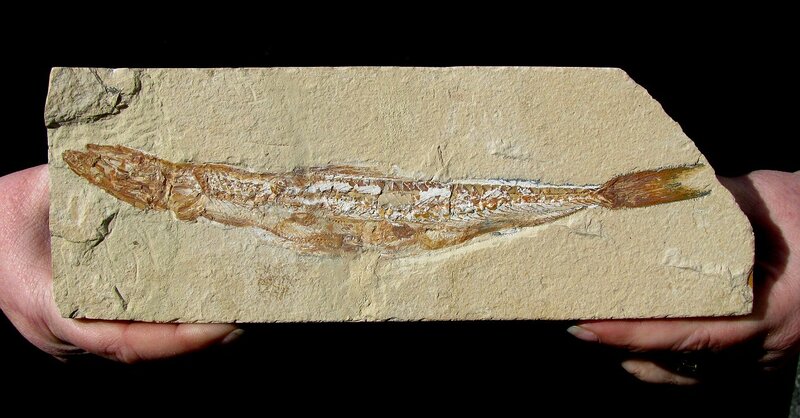 It is a unique Prionolepis cataphractis from the Cretaceous layers of Lebanon. Fossils from this region have become increasingly difficult to obtain due to political unrest. This sleek type of extinct, salt water fish is quite carniverous, high up in the Cretaceous food chain. The HUGE fish (almost NINE inches long!) is complete from the bony head to the near-perfect tail. The fossil itself is nicely centered on the large, rectangular plate of limestone. But the real rarity of this specimen is that there are TWO fish preserved in its stomach! The fish were swallowed upside-down head-first, and are easily seen in the belly of the large Prionolepis. If you look closely, you can see two distinct set of backbones preserved. The swallowed fish are a little jumbled - he tried to cram two fish in his belly, what do you expect! It is extremely rare in the fossil record to have this distinct occurrence of predation captured in such detail, let alone TWO fish at one time. This is is an ultra rare example of a predatory fossil fish fossilized with its huge last meal still in its tummy.